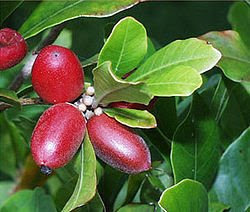 The Miracle Fruit plant (Synsepalum dulcificum) produces berries that, when eaten, cause sour foods (Such as lemons and limes) consumed later to taste sweet. The berry, also known as Miracle Berry, Magic Berry, Miraculous Berry or Flavour Berry, was first documented by explorer Chevalier des Marchais who searched for many different fruits during a 1725 excursion to its native West Africa. When the fleshy part of the fruit is eaten, this molecule binds to the tongue's taste buds, causing sour foods to taste sweet. What’s most really amazing about it, is our sense of taste is so influenced by visual stimulus. How fascinating. Why Manacing? How can it be related to synesthesia? Whoops, sorry this was meant to be on a different blog. My mistake. I'll try to take it down. Sorry you took it down, I quite liked it, Could have aroused some interesting discussion perhaps, I'd conser putting it back up and reflecting on my earlier questions, who knows what ideas might arise. I hope this goes some way to making up for my mistake. If you'd like me to post the Richard Box stuff again I can do. Have a look on the ooxxoo and see if you think it might be relevent to this blog.